My Vegan Brandy Butter is a hard sauce which, on contact with something warm, becomes a drippy, rich & boozy sauce. 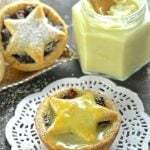 It is absolutely perfect when slathered over hot mince pies or Christmas pudding! Add all of the ingredients to a blender and blend. I use the smoothie setting on my Blendtec but if you don’t have that, start on low and work up to high over the course of 30 seconds. If your blender is not a high powered one then it might take a little longer. The result should be very smooth but don't let your blender run so long that the butter gets warm. Pour into a small jar or other lidded container and refrigerate until set. Once set the butter will have the texture of very thick , stiff frosting but it will melt into a deliciously smooth, sauce. This butter can be frozen. I should keep well in the freezer for up to 3 months if frozen soon after it's made and kept in a sealed container.